Here’s what our enewsletter looks like to recipients. This chart shows the growth of our subscriber list. 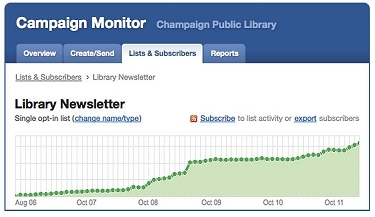 With my name as the sender, the Champaign Public Library’s email newsletter currently reaches about 7,900 inboxes a month. And it seems to reach patrons as well—enough to give my name a familiar ring. Like any good relationship, this one should be built on trust. Library users give us permission to contact them. We should respect their valuable time by giving them worthwhile information—and only what’s expected, no more. Marketing guru Seth Godin calls this relatively new approach “permission marketing,” defining it as “the privilege (not the right) of delivering anticipated, personal and relevant messages to people who actually want to get them” (http://sethgodin.typepad.com/seths_blog/2008/01/permission-mark.html). 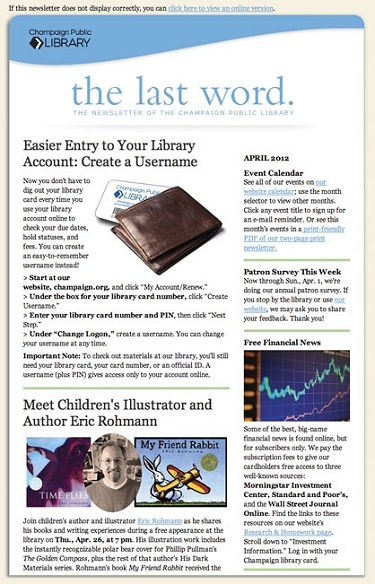 It’s a privilege our library took seriously as we introduced our email newsletter. Located in east central Illinois, the city of Champaign has a population of 81,055 and adjoins a twin city, Urbana, whose population is 41,250. Our library is among the busiest in the country, checking out 2.5 million items last fiscal year from a main library and one branch. Our library began mailing a monthly newsletter, The Last Word, in 1996. From the start, we were dedicated to providing practical tips in addition to promoting events and news from our Friends group and our fundraising foundation. In 2006, we received a grant to fund a website redesign. With email newsletters becoming more popular, we requested an enewsletter template to coordinate with our new site. Our web designers chose Campaign Monitor (a service similar to Constant Contact) to manage our mailings. We planned to continue our paper newsletter, establish an enews mailing list, and then encourage readers to switch to email over time. Permission is key with email newsletters. Every emailing service has strongly worded policies stressing that recipients must opt in, agreeing to be contacted about the topic of your message. They also warn against using older email addresses from people you haven’t been in touch with recently. The risks are great for both the emailing service and your organization. If too many recipients label your message as spam, the emailing service could have its servers blacklisted by internet service providers, and you would no longer be welcome to use that service. MailChimp, for example, draws the line at one complaint per 1,000 recipients. You may be able to exceed the limit once, but repeat offenders will be shut out. The ins and outs of what defines “permission” are so complex that Campaign Monitor has an entire page of potential scenarios that may or may not constitute permission. Most of the guidelines apply to commercial entities, with reference to purchases, stores, and trade shows. It’s not always clear how they apply to libraries. We had a potentially great head start. We already had email addresses, plenty of them, that patrons had added to their library account profiles. The ideal solution seemed to be to send an email directly from us to invite these patrons to sign up for our enews. However, our patron records were part of a library consortium database. The consortium sent our patrons notices, not us. Our information technology staff warned that if our message seemed to be from an unfamiliar source, we could be seen as spammers, and our servers could be blacklisted. In addition, some of those addresses had been provided some time ago, which might not meet criteria for recent permission. Perhaps we could email only our newest cardholders. To get started, we chose the safest approach, requiring a clear opt-in. This seemed to best match the permission policies we were required to follow. First, we added a newsletter checkbox to our library card registration forms and asked circulation staff to encourage sign-up. Then we used a variety of means to encourage patrons to sign up on our website, which is always an acceptable way to add names. Our inaugural issue in October 2006 went to 236 recipients. New names came in at a rate of 50 to 100 a month from a pool of about 400 new cardholders. We tried tweaking the form design to make the enews invitation more noticeable. Staffers promised to do their best to encourage sign-ups but noted that they already had a lot to communicate during the registration process. By February 2009, we had 2,844 addresses and a healthy level of interest from those who were receiving our emails. Between 35% and 40% of recipients opened each issue, which is an excellent open rate. Very few unsubscribed. At a penny per address plus $5 per mailing, the total cost was just $33 per mailing. At the same time, we were spending about $3,600 per issue to mail our six-page paper newsletter to nearly 10,000 addresses. The recession was taking a toll on local property tax revenues, which provide about 90% of our funding, so we needed to make cuts. We decided to discontinue the printed newsletter mailing, though with reservations. We were concerned about the effect on fundraising, particularly among older donors. Knowing that some patrons preferred words on paper, we created a single-sheet publication—a “mini newsletter.” Available at the library but not by mail, it features about 10 brief articles on one side and an event calendar on the reverse. Our main focus, though, was to encourage patrons to move to our enews. During a 3-month campaign, we announced the change, emphasizing the environmental benefits along with needed cost savings. We pointed patrons to a sign-up button on our homepage. For those who might not have email, we explained how to set up an account. To make sure our donors were informed, we mailed them oversized postcards. We added a newsletter sign-up link to our email signature lines. And we reassured patrons that a printed newsletter would still be available. Before our campaign began, we had 2,844 addresses on our email list. A month after it was over, we had 5,055, a 78% increase. Knowing that we might suddenly have an influx of new addresses—potentially alarming to our emailing service—I contacted Campaign Monitor to explain what was happening, and there were no problems. Few patrons have said that they miss the mailed newsletter. The impact on fundraising is difficult to gauge, but we continue to have success with private giving. The mini newsletter is a hit; we give out close to 1,000 copies per month. As for the enews (see a recent issue at http://tinyurl.com/78gc6kl), we continued to build our mailing list through library card registrations. But the number of sign-ups started falling, though we had no decline in registrations. For a while, we attributed it to email overload, but it was something else. Those of us who were managing the newsletter list were unaware that the library was moving toward an online process for library card registrations—with no way to note a newsletter opt-in. Asking staff to use a paper form to gather newsletter names would have been a time-consuming step backward. Given this dead end, we again considered the possibility of adding all new cardholders. I revisited Campaign Monitor’s policies. There was a scenario I didn’t recall seeing before, stating that if people “signed up directly on a form in my store,” that was “clear, direct permission,” and you were “good to go.” It continued, “Just make sure you email people regularly (don’t leave it months before contacting them) and that you send them what you promised you would.” That seemed to fit what we were doing. In addition to that, for the few months prior, we’d been experimenting with how emails from us (as opposed to the consortium) would be received by patrons. Perhaps they didn’t draw that distinction as clearly as we did. To avoid compromising our Campaign Monitor account, we used MailChimp to send new cardholders a one-time “welcome” message with helpful links and tips. Once a month, our technical services manager pulled names from the database and handled this mailing. Although that message generated a few unsubscribes, it also had a strong open rate of around 33%. We planned a trial. Starting in March 2011, we would add 1 month’s worth of new card registrants to our Campaign Monitor list and watch the reaction. We also added a note to our welcome message, letting patrons know that they would be receiving our enews soon and explaining how to unsubscribe. It turned out, most new cardholders didn’t mind hearing from us. Now, 1 year later, our list exceeds 7,900 and is growing steadily. Our average unsubscribe rate remains around 0.4%, with few or no “spam” designations. Our open rate is still a healthy 20%. A designated member of our circulation staff is responsible for pulling a list of new adult card registrants each month. For patron privacy, our mailing list is maintained only by our development director, one volunteer, and the promotional services manager. In addition to my occasionally being recognized by name, our newsletter does generate other feedback, with a number of readers taking the time to send enthusiastic compliments. The emailing service also provides extensive usage data. Permission-based marketing is a new world, and we’ve been navigating it carefully. Our enews list has grown gradually, but we understand that email and privacy are delicate matters. Seth Godin says that in permission-based marketing, “treating people with respect is the best way to earn their attention.” That seems to be working for us—and for our patrons. Elizabeth Otto is promotional services manager at the Champaign Public Library in Champaign, Ill. She holds a B.S. in natural resources from Cornell University in Ithaca, N.Y., and an A.A. in visual arts from Parkland College in Champaign, Ill. Her email address is EOtto@champaign.org.